The next package bee delivery will be this weekend. The rest of the 2 lb and all of the 3 lb packages will be on this load. I will have the bees sometime on Friday. The bees will be available as soon as I have unloaded them. The main pick up day will be Saturday. When you come to pick up, turn into the driveway with the sign that says B's. Saturday pick up will follow this schedule. Check this blog to make sure they have arrived. Here we are at late April. Passing out bees Merry Christmas. The first load of bees have arrived early. If the folks I contacted to pick up on this load can do so now. The first load will be in on Friday. It is a partial load of 2 lb packages. I have called or e-mailed everyone on this load. If you have not received anything from me then you are on the May 2nd load. The second load is the rest of the 2 lb and all of the 3 lb. Pick up for the first load will be this Friday or Sat. Friday pick up call after 9 am or check the blog to make sure they have arrived. Pick up Friday until 7 pm. This is a partial load so I can condense the pick up time on Sat. 1pm - 5pm open to everyone that can't make this schedule. I will be around until 5 pm Sat. Call me if you need a later time. Check this blog to make sure the bees have arrived. The first load of 2 lb packages will be here sometime Friday the 25th of April. It is a small amount, about 1/3 of the load that I have coming. I have e-mailed and called everyone who is on this load. If you did not get anything from me then your bees will be on the next load, one week later than this one. I don't know what time of day they will be here on Friday. Watch the blog for updates. Pick up is on Friday and Sat. Please know that you may not get the queen you ordered. 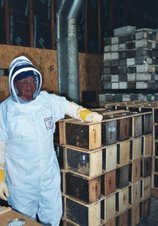 But you will get a mated queen with the bees.This will apply to both loads of bees. My bee supplier will be dropping off a small portion of our package bee order . On Friday April 25th. This will only be part of the 2 lb order and only 2 lb packages. The rest of the 2 lb and all of the 3 lb will follow a week later. I will be contacting you if your bees are with the first order. Everyone who is on this order will be contacted by Friday via e-mail or phone. There is going to be another load of bees. It is looking like 2 weeks. At this time I am going to assume you want your bees. Please get a hold of me if there is a change. A new load of bees? I have been playing telephone tag and e-mailing the bee supplier Ray. I am still trying to talk to him personally. He is working on another load. I want to talk personally to find out the particulars, but I know everyone needs some information. He will probably get a hold of me tonight and I will share the information when I have it. Good morning. I did not get a hold of my supplier this weekend. His business office is open today. We need a decision now and I will work for this today. I have to work my day job today and will give an update after 5 pm. I don't have any new news. I did hear the load over- heated in the trailer and that led to their demise. Being that this is the weekend I am not sure if I will get anything new. I will try tomorrow to get a hold of my supplier. I got the call at 2 am. There has been a bad development. The whole load has died. I don't know what the cause was. My supplier says in our short conversation that he will work on a new load. It might be two weeks out. Everything is a little sketchy at 2:30 am . I will talk to him tomorrow to find out details. Ray Olivarez my supplier, has done everything to make this right for us. Working the phone in Calif. trying to make the load get here. It has been a very stressful time for him. Again Ray and I apologize for this problem and will work diligently to solve this in a positive way for everyone. I talked to the driver a short time ago. He will be here early morning 6 -7 am . Please hold tight and don't show up until the bees are here. I should have a heads up on where he is so people a distance away can plan their drive and get started. When they show up we will start the A - B at that hour and roll from there. Pick up can also happen on Sunday. I realize this is painful to everybody and apologize for this mass confusion. Also it doesn't appear the packages took the full 200 hit maybe only 100. The delivery truck was involved in an accident this morning with several other semi's. The drivers were not injured, the tractor wasn't damaged, the trailer was damaged. The trailer was up on another trailer locked together and blocking I-94. 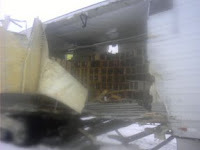 Two pallets of bees fell out of the truck, they were banded together and other than the drop, really not in bad shape. They got the trailers separated. The surviving bees will be reloaded on to another bee truck that was in the area and will be on the way here. I expect delivery tonight around 9 pm. Barring any more problems. Now the bad news, around 200 packages were lost. I have to make those numbers up. Everyone will be sharing the pain. If you ordered one package you will get that package. If you ordered more, you will not get what you ordered. The size of package and race of queen may change also. At this time I don't know for sure if they will be replaced. My supplier wasn't making any promises being this just happened. Refunds for the bees will be sent out in the next 10 days, I can't do it on the spot. I am planning for Saturday pick up here. It is very important for everyone to stick to the schedule for pick up. There was no Friday pick up so more people will be coming. I will be here Sunday also for pick up so people in the blizzard don't have to rush here. When you come to pick up turn into the driveway with the sign that says B's. I have no new information as of 5am. I will update this after 4 pm today. The delivery truck from Calif. has been turned around in Utah do to 2 feet of heavy snow. Their new route will take them through North Dakota down 94. This will delay the pick up. Saturday might or might not happen. I will update this as more information comes available. I will be putting in new packages this weekend. Start a package in no more than one deep box. If I have drawn comb but no honey, I will spray syrup in some cells on a couple frames to give the bees food that they can access immediately. I will plug the entrance with grass to hold the bees in the hive for 24 hours. I know if I don't do this the bees my abscond. Installing the bees at around 6:30 pm is the best time to put in the bees. Putting them in earlier the bees may move off to one side of the box seeking warmth of a sun heated box. This will get them off of the feed pail possibly causing starvation. When it is cold like Sat will be, I will not directly release the queen. I will pull out the cork in the queen cage and stick a mini marshmallow in the hole. Dip the cage in the mass of bees that I have dumped in the bottom of the hive to get bees to cover the cage. I then will pinch the cage between the top bars near the center of the hive, not under the feeder pail. The bees will chew through the marshmallow in a couple hours. The whole time keeping the queen warm. The day after I install the bees I will come and pull the grass out of the entrance. Also take off the telescoping cover and lift up the feeder pail. I check the feed pail to make sure it has not leaked out. Looking under the pail I should see a large mass of bees. If I don't see this I know the bees have moved off to the side of the colony. I will have to light a smoker and open the hive to find where the bees are. If they have moved off to one side I will pull empty frames from the opposite side of the hive, then gently slide the frames the bees are on over to position the bees under the feeder pail. Failure to do this will lead to a starved colony.